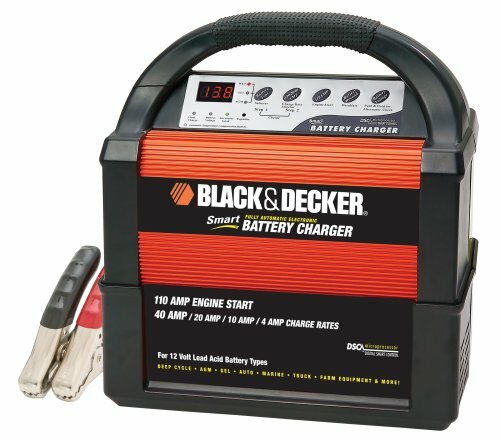 The Black & Decker automatic Smart Battery charger is spark-resistant and features a reverse hook-up, overcharge protection, and solid state circuitry. It features three-stage, automatic, high-frequency charging technology for quick and easy charging. I bought this charger from Amazon a little over a year ago and use it about once a month. The fan became raspy when starting after about nine months but would sound ok once it it got going. Now it has stopped altogether. Interestingly, I was Googling this charger and "fan" and this Amazon review site popped up. I see it's happened to others as well. A fan failure after a bit over a year shows very poor quality, especially since mine is not an isolated incident. How many people had this problem but bought them elsewhere or who don't post reviews? And the warranty issues are as I would expect. While I have the floor, my policy on warranties is: If the item is expensive or I don't trust it, I go to a big-box/any-local store where I can return it for 6 months, no matter what. Other than that, on the internet, there is no warranty. This item is inexpensive; I can try a Schumacher next. There's no way I'm going to find a box, pack it, trudge to a shipper/P.O., pay to ship it, hope. Anything I buy on the internet is a done deal. As an engineer, I'm going to open mine up and see if I can find a similar fan on DigiKey. If I find one (and think of it), I'll post it here. Be prepared to perform surgery. I've seen previous posts stating that the fan is only to cool the CPU. I doubt it. As light as this is and the with amps it can deliver, this is obviously using switcher technology which definitely has actual heat sinks or, probably, cooling surfaces (still heat sinks). A transformer-based charger would weigh MUCH more. The CPU would probably be the last thing to fail and the power semiconductors or any copper would be more likely. But, no matter; if anything fails, it's toast. Also, DO NOT USE THIS CHARGER ON Odyssey batteries. I tested the AGM mode and it does go over 15 volts, which will destroy an Odyssey battery. At hundreds of dollars each, losing an Odyssey hur ts. I haven't lost any due to this charger (because I won't use it) but have lost two to solar chargers. The solar chargers will only supply 100mA (.1 amp) but they can reach 20 volts, open circuit, which is enough to ruin an Odyssey. This may also apply to Optima batteries sold in auto stores as they are also made by Hawker. Aside from an "equalizing", which requires a nail in a hole on this charger, I don't think ANY charger should EVER go over 14.5 volts. There's no point. I concur with other comments about the fact that it won't even try on a completely dead battery. I can see needing SOME voltage to detect a reversed connection, but give a guy a chance. Just say "voltage too low" (or reword the instructions) rather than declaring the battery shot. And provide an override button. There are two ways around this. 1) Charge with a "dumb" charger or a trickle charger for a while or 2)(cumbersome but faster) Use jumper cables to connect a good battery in parallel and start charging immediately. Remove the good battery and recharge it later. Also, their "recondition" mode (I forget what they call it) does nothing. Plus, it stops after a day or so (I forget that, too). I have two "zappers" (desulfators) that I built and they work very well. But they take a month, or two, or three; no way should a zapper stop after a day or two. I built my own but Jaycar (Australia) has a very similar kit, with improvements over mine. If the B&D "reconditioner" didn't stop so soon, it might work, who knows? There's no way anything could work in less than a few weeks, other than a very mildly sulfated battery. Also, I don't know what kind of voltages this charger uses in recondition mode, but mine, at 80-100 volts, can damage your car's radio, engine-computer, etc. To be safe, remove the battery from the car; do not "recondition" an in-vehicle battery. Wet-cell batteries (with lead plates/honeycombs) develop a sulfate coating on the plates when left discharged for a period of time. (This is why you should put float chargers on wet-cell batteries, but there's a catch). Constant float charging will dehydrate your battery, no harm done. Just add DISTILLED water and you're back in business. I put mine on a 24-hour timer and run them for 1 hour out of every 24. Back to sulfated batteries: everything is perfect, good lead, good acid but the sulfate coating acts as an insulator that prevents charging/discharging (use). The most obvious indicator is that a very dead battery will reach a full-charge voltage very quickly, too quickly. Even a trickle-charger will bring it to full voltage is minutes, if not seconds. The zappers work by pulsing the battery with 80-100 volts for 50 microseconds 1000 times a second (every millisecond). The theory is that this causes the plates to vibrate (somehow, it's a mystery) a nd break off the sulfate coating. It does work but it's extremely slow. You can't desulfate the battery from your daily driver overnight. You must buy a new one and then desulfate the old one for non-critical use. So, would I recommend this charger to a friend? No! 1) An early fan failure is not acceptable. This is just trash, considering it's happened to others. If you don't know to listen for the fan, your unit will eventually emit acrid smoke. Game over. If you listen and hear no fan, stop - pull the plug. If you can't replace the fan, game over. If it weren't for the fan failure, I could live with this charger. I am severely peeved. chargers are set at 13.5 volts. I like them and use them. 3) Any reconditioning, desulfating, zapping operation should continue until the user terminates it. A da y or two is ludicrous. desulfate old batteries, this is a very useable product. UNTIL THE FAN DIES. This battery charger is very versatile and powerful for its size. I am a mechanic and it is nice to have all the features of a full size battery charger in a unit that will fit in my toolbox. Looks big, but is fairly lightweight. Highly recommended. Very impressed so far. Used it to recondition 2 batteries and charge up 2 others and it has worked flawlessly. Never impressed with Black and Decker tools but I think they got it right this time. Time will tell and I would have given it 5 stars if it holds up for a few years.